Home » Information » What Type Of Humidifier Is Best For Baby Congestion? Congestion, difficulty breathing, and other symptoms of colds can really cause your baby to suffer a lot. Constantly breathing in dry air makes it even worse! I know, as I’ve personally dealt with the same and it’s terrible. Owning a humidifier was one of the best things I ever done! But what type of humidifier is best for your baby’s congestion? In this detailed post I’ll tell you. I’ll also show you can check the air moisture level, what humidity levels are ideal for babies, and a few recommended models. 3. What type do I need for my baby? 4. What is humidity and how does it affect babies? 7. 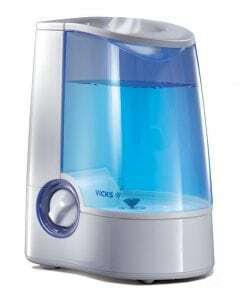 How much do humidifiers cost? While warm and cool mist humidifiers are very similar in what they do there are details you need to know. 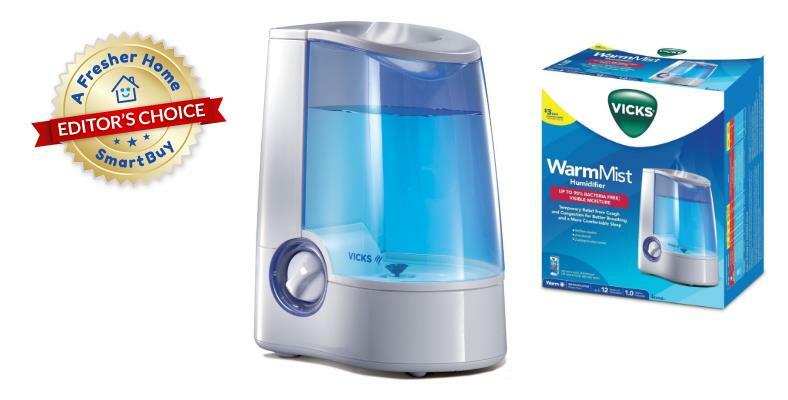 Warm mist humidifiers like this very popular and inexpensive Vicks V745 model produce a very fine steam that’s created by heating water. They’re fantastic for helping to relieve a baby’s dry nose and throat as well as congestion. They’ll also help your child sleep better, too. Warm mist humidifiers increase the humidity in a room by creating a slightly warm steam that results from heating water. Unlike cool mist humidifiers, the water vapor (steam) isn’t at room temperature, but does have a bit of additional warmth that it brings into the room. However, it’s a gentle, soft amount that’s not overbearing like running a how shower or other sources of water vapor. Many feature a vapor level switch or dial to control how much they produce. Additionally, warm mist humidifiers produce the closest thing to natural humidity found outdoors. 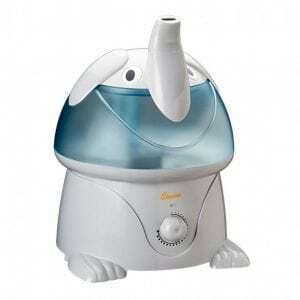 Products like the Crane elephant kid's cool humidifier create water vapor that increases room humidity differently. They use electronic methods such as ultrasonic technology to turn water into a fine mist. They don’t use or add heat to do so. Cool mist humidifiers are similar in the job they perform but a bit different in how they add humidity. This type uses electromechanical technology like ultrasonic vibration to turn room temperature water into a fine mist released into the air. They do not use heat or add heat to a room. While they’re great for helping many conditions a baby may suffer from, when it comes to congestion it’s a different matter. These types are a great match for dry climates as they won’t add temperature to a room. They’re also still very helpful for relief from typical dry air symptoms like dry skin, difficult sleeping, and greater sensitivity to allergens. What type do I need for my baby? In most cases a warm mist humidifier is best for your baby’s congestion. For conditions such as colds and other congestion-causing sickness a warm mist doesn’t just relieve dryness for your child. They’re also very helpful for relieving congested sinuses and throat problems. A warm mist humidifier’s biggest advantage is that it produces a warm steamy mist that’s extremely helpful for cold and sinus congestion relief. It’s a remedy that’s been around forever and is still recommended today by medical experts. Just like how a hot steamy shower can help your cold by opening your sinus congestion and allow mucus to leave they work the same way. Additionally, the water mist brings the air back to a natural, healthy state. What is humidity and how does it affect babies? 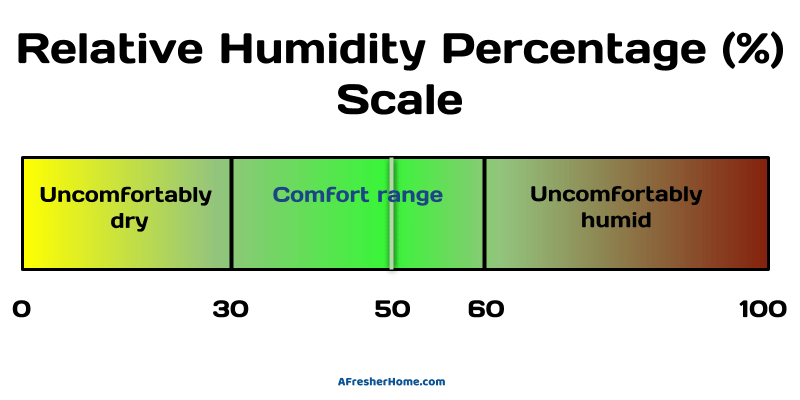 Humidity is a term used to described the amount of water moisture in the air around you. We rarely think about until the air gets too dry and we begin to feel the effects. 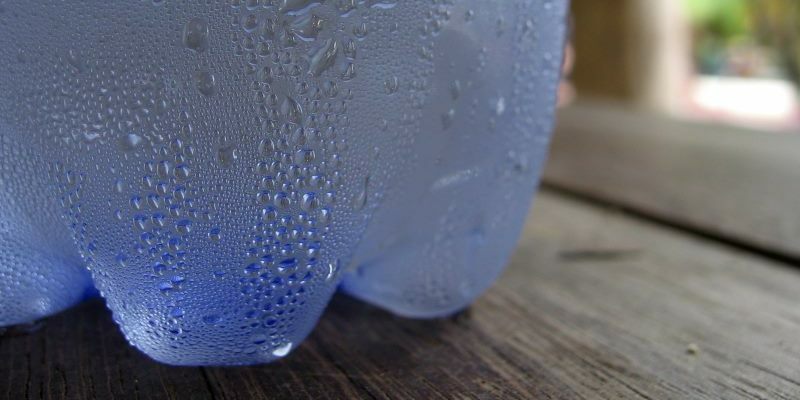 Condensation on cool objects (like the bottle picture above) is caused by nearby water molecules in the air collecting (condensing) on a surface. Humidity is of measuring the amount of moisture present in the air around us. For example, after a hard rain and when the sun comes out the outdoors feels very “muggy” and uncomfortable. It’s because of extra moisture released into the air. Likewise, the reverse is true. In dry climates and during the cold of winter the air feels very dry and we begin to feel the symptoms of dry air. That’s due to very low humidity. Relative humidity is scientific name that just is used to describe how much humidity is in the air for a given temperature, essentially. Babies are much more sensitive to hardships like higher temperatures, humidity problems, and air quality difficulties than adults. You should never assume they’ll be able to handle uncomfortable conditions the same way you can. It’s critical to give them safe – and comfortable – humidity levels at home. High humidity if sound in many climates like those near coastal areas (locations near an ocean or other larger body of water). It’s also common in areas like where I live: the southeastern United States. In those areas, the air, when humidity is high, feels exceptionally uncomfortable and even more “hot” even though the temperature might not be so high. The reason is that high humidity conditions prevent you and your baby from being able to cool well. For babies this means that they’ll have a difficult time sleeping, they’ll sweat much more than normal, and they’ll be much more irritable and upset. For situations with high humidity you’ll need an air conditioner or a high-quality fan like I recommend here for cooling of your child’s sleep area. The typical cold and other sicknesses (including congestion) are especially hard on infants and babies. Unfortunately, the sad part I’ve learned is that so many of these are preventable. Sadly many mothers and fathers don’t use humidifiers to relieve the dry air which is responsible for their baby’s suffering. It’s truly heartbreaking if you think about it! At healthy humidity levels (between 40 to 60%) the human body produces normal and healthy amounts of mucous in breathing passageways such as the sinuses, throat, and nose. When moisture levels are extremely low these membranes in the body dry out and cannot produce normal levels of protective and moist covering as the normally would. This causes these breathing passageways to dry out and results in pain and discomfort. They’re also more susceptible to sickness-causing microbes and other airborne contaminants. To keep your baby comfortable, reduce sickness, and relieve congestion, you can use a humidifier to bring the level back into the comfort range as shown here. It’s not a requirement for it to be exact – just bringing it back to a healthy range is fine. You’ll need a humidifier when the humidity drops to low levels. To be more specific, when the humidity around your baby’s room or in your home reaches 30% and below it’s time to use a humidifier. The ideal range you’ll want is between 30%-50% approximately. It’s perfectly fine if it’s not exactly that number. We just need a general range to breathe and live well. Ideally, a good rule of thumb to use is 40-50%. In order to know and check your baby’s comfort level, all you’ll need is an inexpensive one like this great little one from Amazon. 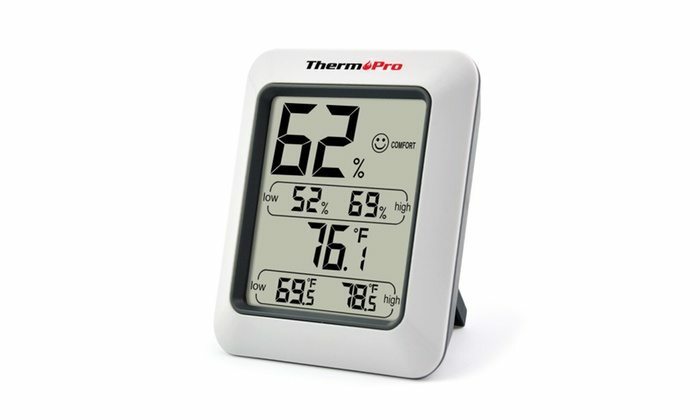 Also called a “hygrometer”, it’s simply a digital humidity level meter that also measures temperature as well. I own one and it has helped me tremendously! To know what’s really going on in the temperature and humidity around your baby, you’ll want to use a hygrometer, which is simply a device used to measure humidity levels. Today’s models are inexpensive and use a digital device to measure, calculate, and display not only the humidity but temperature as well. They take the guesswork out of wondering how dry the air is around your child and home. I own one personally and it has been incredibly helpful. When I became sick with a cold (and during times I wasn’t sick) last winter I was having difficulty sleeping. My cold was even more difficult because of the dry air! I picked up a digital humidity and temperature gauge and discover the humidity in my home was very low – down to 20% and below. Immediately I was able to see I needed a warm mist humidifier to help relieve my congestion. That’s exactly what I purchased and it helped me so much. Some, but not all, warm mist humidifiers allow the use of add-in liquids or pads to give added cold and congestion relief. Left: a medicated liquid example. Right: solid pads which are placed in a special opening and release soothing menthol as the water vapor passes by. Some humidifiers types (see below for a great example) have an extra feature which allows adding medicated vapor liquids or solid pads. The humidifier then fills the air with the soothing combination which helps your baby’s congestion even more. Menthol and related mixtures are some of the most common. However, it’s important to know beforehand that the model you buy allows these – especially liquids. Some manufacturers recommend that you don’t use anything besides standard distilled water. While there of course just an option, they’re very helpful and your child will feel relief every time they’re used. For a both warm mist or cool mist humidifiers, you can expect to spend roughly $25-$60 or so depending upon the room size coverage, water tank size, and features. Generally speaking I’d recommend planning to spend around $35 and above for a great model that will be effective at relieving your baby’s congestion and colds. Although there are many inexpensive models on the market or those designed for small rooms, I don’t recommend those. By shopping smarter and buying a model with a larger water tank you’ll save a lot of work and effort as you won’t have to refill the water tank as often. 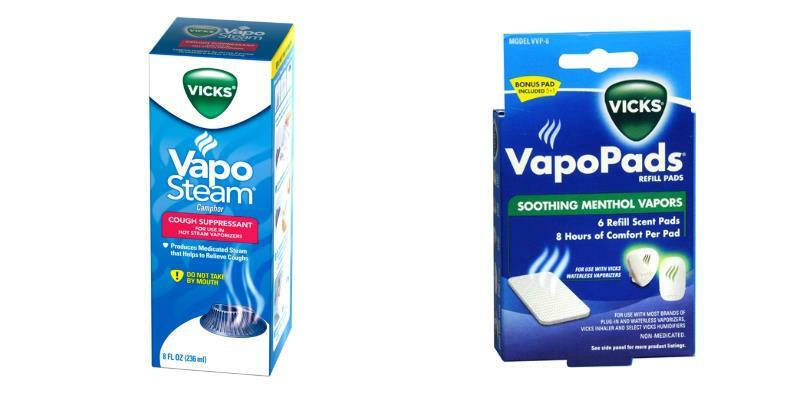 I’ve awarded the Vicks V745A my Editor’s Choice award and recommend it as a best buy and a great overall value. It’s affordable (below $50) and provides all the same great features you need to help your child’s congestion, colds, and much more. It’s also identical to the same model I own and personally use, so I speak from personal experience when I say I’m very happy with mine. There are 2 steam settings (high and low). There’s also auto-shutoff when the water runs out, a 1-gallon water tank, an empty tank/shutoff light, and you can add both pads or liquids, too! I get about 8.5 to 12 hours of use out of mine with one tank of water. It’s great for sleeping, and it’s very quiet. Check it out! Be sure to head over to Amazon and see so many people love it for their children as well.